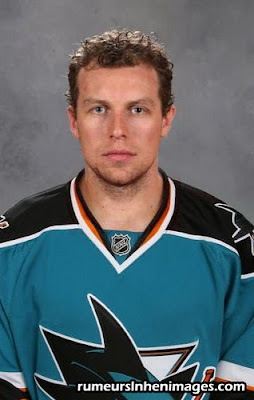 Hockey Plumber: Dany Heatley: Did the Sharks Really Get What They Need? Dany Heatley: Did the Sharks Really Get What They Need? So Dany Heatley has finally been granted his wish... and the San Jose Sharks added a big time sniper... the Sharks just became the favorites for the Cup, right? I am not convinced, are you? Since the lockout, the Sharks have posted impressive regular season numbers and then have been unceremoniously bounced from the playoffs within the first two rounds. In three of the last four seasons, they have been eliminated by teams seeded 5th or lower, including twice being knocked out by the 8th seed! After yet another playoff embarrassment last season, GM Doug Wilson promised "big changes." Mr. Wilson has indeed delivered big changes this off-season, but it was assumed that these moves would be made to make the team a more post-season minded, but the transaction sheet indicates the contrary. The Sharks moves have included trading veteran defensemen Christian Ehrhoff and Brad Lukowich for two prospects to create cap space, and now swapping Milan Michalek, Jonathan Cheechoo and a draft pick for Heatley. Essentially the Sharks' "big changes" have amounted to subtracting Ehrhoff, Lukowich, Michalek and Cheechoo and replacing them with Heatley and a slew of minor leaguers and/or prospects to fill their roster spots. You can argue either way whether the guys that the Sharks sent packing were part of the problem or the solution in San Jose. However, the last time Dany Heatley participated in the post-season, he looked awfully disinterested while his team was swept in the first round. The Sharks no doubt changed the names on the roster, but their post season forecast looks much the same.